Christians believe [Jesus Christ] to be the Son of God….according to Christian teaching after three days he rose from the dead….Christians believe that there is only one God, but that he is revealed in three different forms. The Qur’an was first revealed to the Prophet Muhammad during [Ramadan]. The actual night that the Qur’an was revealed is a night known as Lailut ul-Qadr (‘The Night of Power’). The difference, of course, is that while the details of the founding of Christianity are presented as a set of beliefs, the supernatural elements of Islam’s founding narrative are recounted as if they were historical fact. After 9/11, it was imperative that people in the West be educated about Islam. There was no need to stuff their heads with countless historical and theological details; all that was necessary was for Western leaders to get across the point that Islam isn’t just another religion but is, rather, totalitarian ideology with religious elements. That never happened. Instead, we were all told repeatedly that Islam is a religion of peace, that all those terrorists are misunderstanding it every time they do something naughty, and that the chief victims of their misunderstanding are the overwhelming majority of their fellow Muslims who are thoroughly decent, God-fearing types. Perhaps I shouldn’t have been surprised to discover how many books have been written with the sole objective of giving non-Muslim children an utterly sanitized picture of Islam. Example: Mommy’s Khimar by Jamilah Thompkins-Bigelow and Ebony Glenn. No, a khimar is not a female body part. It’s basically another word for hijab (although some sources insist on certain niggling distinctions). The book, written for children aged 4 to 8, is about a little girl who marvels at the beauty of her mother’s closet full of khimars, which come in every imaginable color and pattern. “When I put on Mommy’s khimar, I become a queen with a golden train….When I wear Mommy’s khimar, I shine like a star.” The whole thing is a not-too-subtle attempt to sell little girls on the idea of covering themselves up in strict Islamic fashion. Ditto Michelle Khan’s The Hijab Boutique, in which Farah, a fifth-grader, learns that the opinions of the “cool” girls at her exclusive L.A. girls’ school don’t matter and ends up happily attending a new, apparently more heavily Islamic school, joining the Muslim Girl Scouts, and starting to wear a hijab. Lesson: too much assimilation into the host society is no good. Children’s books on Ramadan alone make up a sizable subgenre. They tend to share a handful of key ingredients: the exciting first glimpse of the new moon, which signals the beginning and end of this most special of all months; the demanding but spiritually rewarding all-day fast; the wonderful smells from the kitchen, where Mommy (and maybe Grandma) are working hard at the stove; the big, delicious breakfast that you eat before dawn; the big, delicious dinner that you eat after sundown; the especially big, especially delicious meal that you eat on Eid-al-Fitr. when Ramadan finally ends; the visits from Muslim friends and members of one’s extended family; the reading of the Holy Koran and the trip to the beautiful mosque. In My First Ramadan, by Karen Katz, we learn that Islam “means peace in Arabic.” (Of course, it means submission.) The boy protagonist reads the Holy Koran with his dad and, on Eid-al-Fitr, worships Allah with his dad in the beautiful mosque. His mom and sister “pray in a different room.” The sexual segregation goes unexplained. In Max Celebrates Ramadan, by Adria F. Worsham and Mernie Gallagher-Cole, Max, an infidel, goes home with his Muslim schoolmate Amar to commemorate Eid-al-Fitr with a bounteous dinner. (This book is part of a series; in other volumes, Max celebrates Cinco de Mayo, Martin Luther King Day, and Groundhog Day.) Early on, before Max enters Amar’s house, we see that Max has a pet dog. This dog does not make another appearance in the book. Presumably Max got the memo about Islam and dogs. Either that, or Max’s dog became part of the delicious Eid dinner. You may have grown up on the Curious George books. I did. 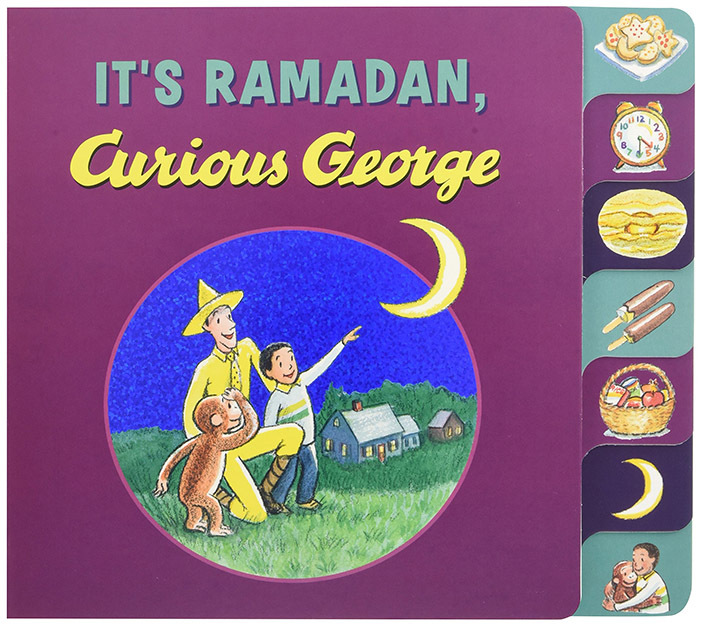 To my astonishment, there is now a volume entitled It’s Ramadan, Curious George. First published in 2016, its authorship is credited to the creator of Curious George, H.A. Rey, who died in 1977, and Hena Khan. In this book, George, like Max, discovers the joys of Ramadan by celebrating it at the home of a Muslim family. (Lucky for him he’s a monkey, not a dog or pig.) This isn’t Khan’s only Ramadan book for kids: she’s also the author of Night of the Moon: A Muslim Holiday Story (2008). Last year, the Voice of America promoted her new book Amina’s Voice, an attempt to depict “the challenges a Muslim teenager faces in the U.S.” Khan made it clear in an interview that the “challenges” all involve virulent American Islamophobia, not the totalitarian nature of the religion itself. “Dad says Ramadan is a time to get closer to Allah,” we’re told in Bullard’s Ramadan book. No surprise there: in all of these Ramadan volumes, it’s invariably Dad who reads from the Holy Koran and/or serves up the bullet points about Islam. Mom? She’s usually busy whipping up delicious meals in the kitchen or setting the dinner table. Traditional gender roles are verboten in most children’s books these days, but they’re obligatory in these books about Islam. In every one that I looked at, moreover, the whole cast of characters seems to be meticulously sharia-compliant. At home, for example, Mommy’s prayer rug is carefully placed behind Daddy’s. Not a single one of these books is about secular Muslims or cultural Muslims or only moderately observant Muslims. The characters are all uniformly devout, the interpretation of the Koran unremittingly literal. It’s hard to imagine a mainstream publisher these days putting out a Christmas or Easter book, say, that’s as packed with strictly pious rhetoric and conduct as these things are. In any event, the list of titles goes on and on: Na’ima B. Robert and Shirin Adl’s Ramadan Moon; Asma Mobin-Uddin and Laura Jacobsen’s A Party in Ramadan and The Best Eid Ever; Reza Jalali and Anne Sibley O’Brien’s Moon Watchers: Shirin’s Ramadan Miracle; etc. No doubt about it: the number of children’s books about Islam that have been published in the U.S. in recent years is well-nigh breathtaking. And the authors of these things are all on the same page, doing their darnedest to make the most dangerous ideology on the planet look wholesome and appealing. Perusing these books, I found myself imagining an alternate post-9/11 universe in which we all had our heads screwed on straight about Islam – a universe where the children’s books on the topic (if any) had titles like Daddy Joins ISIS and Grandma Gives Asma a Clitoridectomy and Imran and His Friends Beat Up a Jew. Or Faizan’s Parents Build an Explosive Device in the Garage. Or Rashad Helps Daddy and Uncle Ahmed Kill Mommy because Her Khimar Slipped Off. Or Abdul and His Family Cheer the Ariana Grande Attack. No, instead we’ve been given a small library of propaganda for everybody from toddlers to pre-teens – a groaning shelfful of brightly illustrated agitprop. Ever since 9/11, Muslims and their appeasers have been conducting a full frontal assault on the truth about Islam. These books are a tiny part of that assault. But they may also be the most important part. Get ’em when they’re young! Brainwash a kid about Islam in grade school and it’ll be damned hard to undo it in later years, when some of their most heartwarming memories of childhood include reading about the little girl wearing Mommy’s khimar and about Max discovering the joys of Ramadan. That’s plainly the raison d’être for these despicable creations.